The dock is located about 5 km from town. Shuttles are provided into town, free or sometimes paid. However the town has very little to offer. The setting of the port is spectacular, a fjord as one imagines to see on the moon, no vegetation at all. As everywhere in Oman everything is extremely clean and the people are among the nicest you will ever meet. There is a nice little beach right next to the dock, only 5 minutes walking. Sharks are present, but do not like human flesh. Do not forget to go to one of the higher decks of your ship at sunset and watch all the speedboats with Iranian smugglers being loaded with merchandise destined for Iran. A real photo opportunity. 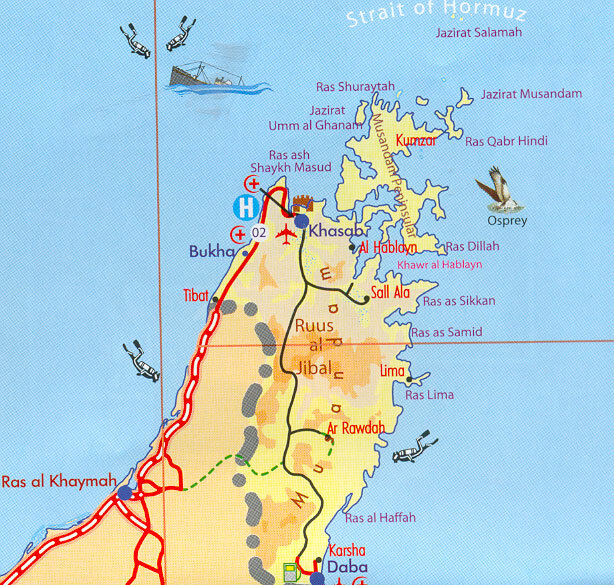 Khasab or Khassab lies at the northern tip of the spectacular Musandam Peninsula. Khasab is still relatively unknown to travelers but its dramatic landscape of towering cliffs and fjord like inlets embrace much scenic beauty. The town is destined to become a major resort in the future. Khasab itself, a calm, fishing village and oasis, which overlooks the Gulf of Arabia and the Straits of Hormuz has not much to offer as far as sightseeing.. Watch the traditional lifestyle of the fishermen and the Bedouins. Visit the restored Portuguese Fort of Khasab, this fort has a Museum where many Omani handicrafts items are displayed. The harbor bursts with activity, much of it involving the smuggling of US cigarettes to Iran in return for goats. The smugglers are mostly Iranian and are distinguished by their fibre glass boats with outboard motors. Every night at sunset this repeats again. You have a very good view of this spectacle from your cruise ship. Take a spectacular and full of thrill dhow cruise to explore the hidden beauty of Musandam fjords. Snorkeling, swimming, dolphin watching, visit to historical Telegraph and Seebi Island and view of small fishing villages. The currency in Muscat is the Omani rial (OMR). One rial is made of one thousand Baisa. Since 1986, the rial is officially tied to the US dollar at 1 rial = 2.6008 dollars; exchange rates on the streets are a percent or two lower. The dhow cruise operators will accept Euro and USD. Arabic is the national language, however most Omanis will speak good to excellent English, particularly in major tourist areas and cities. Shopping hours: Shopping establishments are open from 9am to 1 pm and 4pm to 9 pm. Department stores, supermarkets and shopping complexes are open throughout the day during Ramadan from 9am to 10 pm, with a short lunch break all through the week, except Fridays. These timings could vary with different shops.